This week I asked my Instagram followers to help me with a blog article that was a little different to what I usually do! Their task was to ask me some questions to answer. Here they are! When I first started out although I wasn't treated that much different to my male counterparts, I did get a few mocking and condescending comments such as 'Go easy on the girl', 'Don't hurt yourself princess' and 'Who helped you with your loadout?' from some of the older or very young players, presumably because I am young, blonde and small with manicured nails but they quickly stop once they see you out on the field, giving it all you've got and massacring their team mates with a pink gun haha! Now I am more well known in the community through playing different sites and my Instagram, YouTube vids and being an admin to the UKAC I am treated with a lot of respect both on and off the field. I shouldn't have had to prove my validity as a player, but I have and as a result I am now treated as an equal regardless of what site I am at. The UK community has an abundance of different player types which is what makes our community so diverse and eclectic. I think it really depends on what you mean by 'abstract'. I, like a lot of female players have an aggressive playing style - I love taking point, pushing forward and getting up close and personal with the enemy but I abide by the rules because it is the only way to improve yourself as a player. 'Abstract' to me (I could be wrong!) sounds like playing dirty and taking advantage of the rules, I personally think it is better to play fair and honest to command respect than to win at all costs. But again, it really depends on what you meant by abstract! Although I hate the word 'Operator' I would say the most 'Operator' member of Grey Fox 348 is probably Paul because of his epic tactical beard! Sorry Kieran :P Haha! Younger players are the future of our sport, so it's really important that we encourage them and help them on their way to being good players. I have met some great young players who are really passionate about the sport and take the rules seriously but also some that want to win at all costs, so will resort to non hit taking which is annoying. But I think if you are honest and fair players, you will do well, but there will always be players that dislike anyone who is different to them, just ignore them and carry on! Absolutely! I am really interested in checking loads of new sites this year! I'm hoping to play a game at the Fortress in Liverpool with Mattthemusketeer! 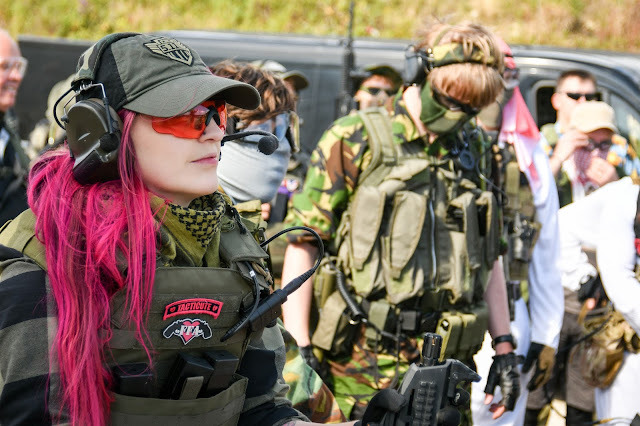 My very first airsoft skirmish was in 2011 for one of my best friend's 19th birthday, I didn't really get into it then but then in August 2014 we organised a private birthday skirmish for my boyfriend and his best mates birthday at a local site and he brought me my own G&G FF26 so I didn't have to use a rental gun. I fell in love with my gun and the sport. I love the adrenaline rush you get when you're taking point and feeling the fear of knowing any second you could encounter an enemy and get taken out, it makes me push myself to play harder. I think the most awesome piece of equipment I could have for airsoft apart from a pink M249 LMG would definitely be some Night Vision Goggles! It would be great to walk into a pitch black room and see everything, then take everyone out. I'm a big fan of spy movies, so these would be really cool! Thank you for the questions! I've really enjoyed answering them and hope to do another in the future! By abstract I mean not breaking rules but rather spending time in woods stalking just for one kill. Or not killing a few players but instead staying sneaky and lurking around to the back side and then killing multiples. Or jumping through windows when it appears there to be no need but it excites people. Abstract as in running full steam at a wood line with no gun but instead a smoke in each hand to motivate a charge knowing i will get destroyed. just crazy, fun, exciting things that seem to upset people who think im show boating or am not layed back enough. Also i play super fierce because my athletic and winning nature comes out and I do not like to win so I do what it takes, within the rules, to make my team win.